Brain scans have been developed which it is claimed can predict what a person is about to do. German, British and Japanese scientists were able to "read minds" using sophisticated functional magnetic imaging (fMRI) and computer programs. Current Biology reported people were asked to think about adding or subtracting - scientists were able to read intentions in 70% of cases. A UK expert advised caution, but said such technologies would develop. Such techniques could be used to help people who are paralysed - there are already some steps being taken towards helping people using computer-assisted prosthetic devices linked to computers. But this research might also allow abstract thoughts and intentions to be read. It may even be possible to carry out instructions such as "send email" simply by thinking them - with a scanner picking up the wish and translating it in a way that the computer can act on. The researchers, led by scientists from the Max Planck Institute for Human Cognitive and Brain Sciences, in Leipzig, asked people to hold their mathematical decision in their minds until they were shown two numbers on a computer screen. 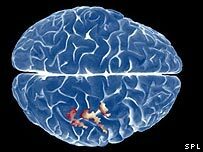 The fMRI scans monitored brain activity for the few seconds they were thinking about their sum, and it was on this information that the scientists made their predictions. The researchers used a method called "multivariate pattern recognition". A computer is programmed to recognise characteristic activation patterns in the brain that typically occur in association with specific thoughts. Once this computer has been "trained" it can be used to predict the decisions of subjects solely from their brain activity alone. Dr John-Dylan Haynes, who led the research, said: "It has been previously assumed that freely selected plans might be stored in the middle regions of the prefrontal cortex, whereas plans following external instructions could be stored on the surface of the brain. "We were able to confirm this theory in our experiments." He added: "The experiments show that intentions are not encoded in single neurons but in a whole spatial pattern of brain activity." It appears regions towards the front of the brain store the intention until it is executed, whereas regions further back take over when subjects become active and start doing the calculation. Professor Colin Blakemore, director of the Medical Research Council, said: "We shouldn't go overboard about the power of these technologies at the moment. "But what you can be absolutely sure of is that these will continue to roll out and we will have more and more ability to probe people's intentions, minds, background thoughts, hopes and emotions." He added: "Some of that is extremely desirable, because it will help with diagnosis, education and so on, but we need to be thinking the ethical issues through. "It adds a whole new gloss to personal medical data and how it can be used."